Use a fork to combine 1/2 cup of light brown sugar and 1/2 cup of white, granulated sugar. In a large bowl, whisk the egg whites at high speed until they turn white and stiff peaks form. Lower the speed to medium and add the sugar mixture, 1 tablespoon at a time; wait 30 seconds between additions. Once you’re done adding the sugar, whisk for another 4 minutes at high speed, until your meringue is hard and bright. Add the vinegar and whisk for 2 minutes at high speed. Make sure you mix well. Place the meringue, one tablespoon at a time, while trying to form a round shape. Put it in the oven and immediately lower the temperature to 250°F. Bake for 1 hour and 20 minutes. Turn off the oven and let it cool completely without opening the door. Place the passion fruit juice and 1/4 cup of sugar in a small pot. Cook over medium heat, stirring until the sugar is dissolved. Once it comes to a boil, reduce the heat to medium-low and cook for 10 minutes. Let it cool. 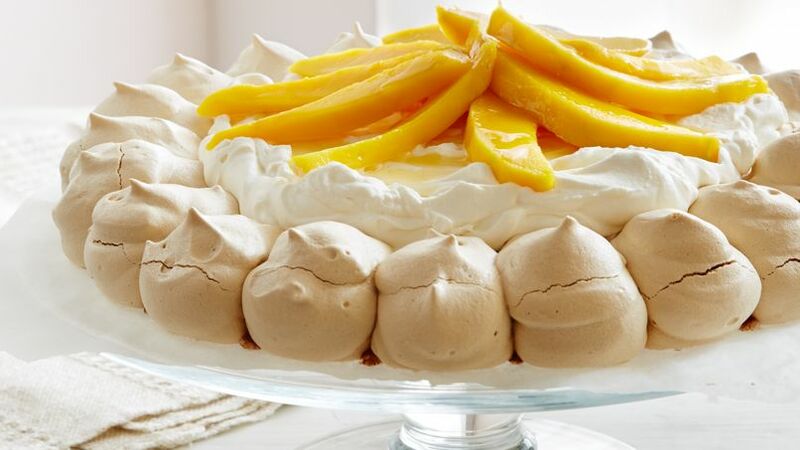 Once the meringue is cold, peel the mango and cut it into thin slices. Whisk the cream at high speed until it becomes firm and peaks form. Reduce the speed to medium and add half of the passion fruit sauce. Assemble the meringue crown. Use the paper to transfer the crown to the plate in which you wish to serve this dessert (don’t remove the paper). Place the whipped cream with the passion fruit over the meringue, and the mango slices in the shape of a flower. Garnish with the remaining sauce. Serve immediately or refrigerate until ready to serve, no more than 2 hours. The paper will allow you to transfer the meringue to the plate when it’s time to serve it. You can also bake it directly in an oven-resistant plate and then take it to the table. Keep in mind that, in order to achieve good results, the bowl and whisk blades must be very clean, and have no grease residue. If you wish to use more mango, you can cut a second mango into small cubes and cook it in the passion fruit juice for 5 minutes. Pilar Hernandez This meringue dessert, known as merengón, is very popular and always well received. The combination of crunchy meringue with the softness of whipped cream and the freshness of fruit is delicious. You can use other types of fruit, depending on what’s available at your grocery store or your family’s preferences.